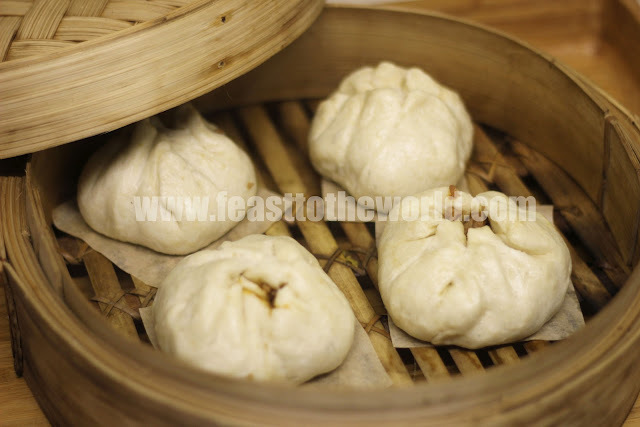 Bao, which means bun is one of the classic staple in any yum cha session. No bonafide dim sum enthusiast will even dare to complete a dim sum brunch without ordering at least a tray of Bao. And Char Siu Bao is the most popular amongst them. Dim sum are served for breakfast or lunch but never for dinner. The word literally mean to gladden the heart and the dishes are just that, serves in tiny portions for a light enjoyment rather that a full on big meal. These are normally accompanied by a nice pot of tea too, hence the term yum cha, which means drink tea in Cantonese. In a traditional dim sum restaurant, the waiter/waitress pushed a serving cart through the dining area and diners were encouraged to stop them as they were near and select individual steaming bamboo baskets containing delectable morsel treats that took their fancy. The waiter/waitress will then noted down the order on a bill which was left on the table and these will all be tally up at the end of the meal. I love Char Siu Bao and last Sunday, I decided to have go at making them. The preparations for this started a few days beforehand as I need to marinate the pork tenderloin and then roast the Char Siu the night before using my own recipe from a while back. The following day, I started by making the Chinese bread dough or Mantou 饅頭. This is slightly different to a traditional dough as it contained noticeably more sugar which made it slightly sweeter and the addition of baking powder gave it the extra rise and fluffiness when cooked. 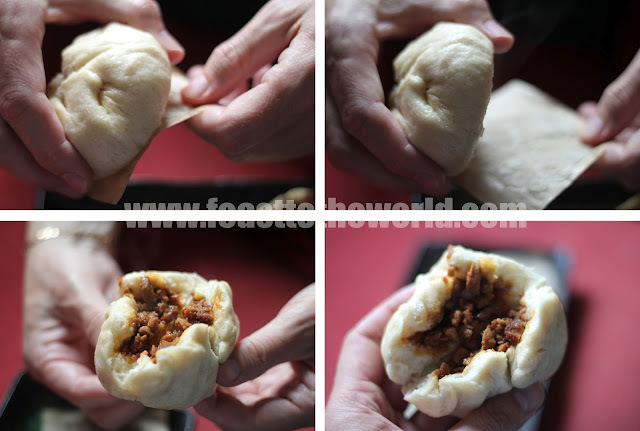 These dough are then filled with sweet barbecue pork and then steamed. After a while, the dough swell up nicely and turned into these light, spongy savoury rolls. The best way to enjoy these delights is to eat it straight from the steamer while it's still piping hot. 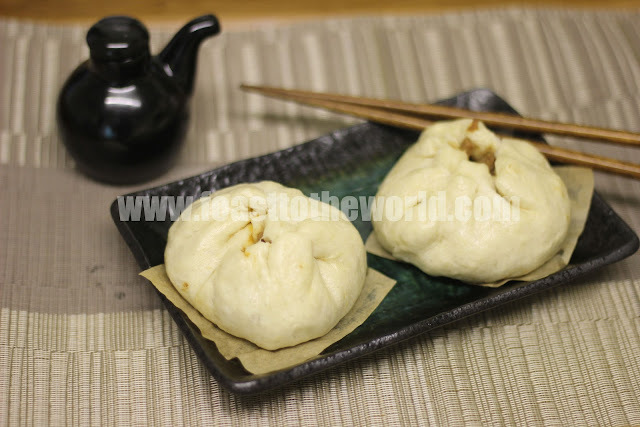 First, peel off the parchment paper square, then break the bun into half to reveal the steaming char siu and take a well deserved bite into the sweet filled bun. My nan would even goes as far as to peel off the skin of the buns too as she put it 'you don't know who's been touching it'. But however you decide to eat it, this is definitely one of the most comforting Cantonese dim sum delight there is. In case you are wondering about the colour of the buns being different to those served in the restaurant, that is because they used bleached flour which gave them a whiter exterior. Turn the mixture put onto a lightly floured surface and knead for 10 minutes. until the dough is smooth and elastic. Place the dough in a lightly greased bowl, cover with a damp cloth and set aside to prove for 2-3 hours in a warm place. After this time, the dough should have at least double in size. Punch it back down to get rid of the air and turn it out onto a lightly floured surface. Flatten the dough to form a well in the centre.Add the baking powder in the well and gather up the edges to enclose the baking powder. Lightly knead the dough for a few minutes to evenly distribute the baking powder. Set aside while you prepare the filling. For the filling, heat up the oil in a wok or pan until smoking. Add the diced pork, oyster sauce, rice wine, soy sauce, sugar and water and cook for 1 minute. Add the sesame oil and immediately remove from heat and set aside to cool. Divide the dough into 6 or 12 portions depending on the size of the buns you are making. Press the dough portion into circle and place 1 tablespoon of filling in the middle (1 teaspoon if you are making smaller buns) . Bring the sides in to enclosed the filling and pinch the top together. Put the bun on a greased square of greaseproof paper. Repeat until all the dough and filling are used up. Place the buns into some bamboo steamer, making sure to space them out as they will swell in sizes. If you steamer is not big enough, steam then bun three at a time. 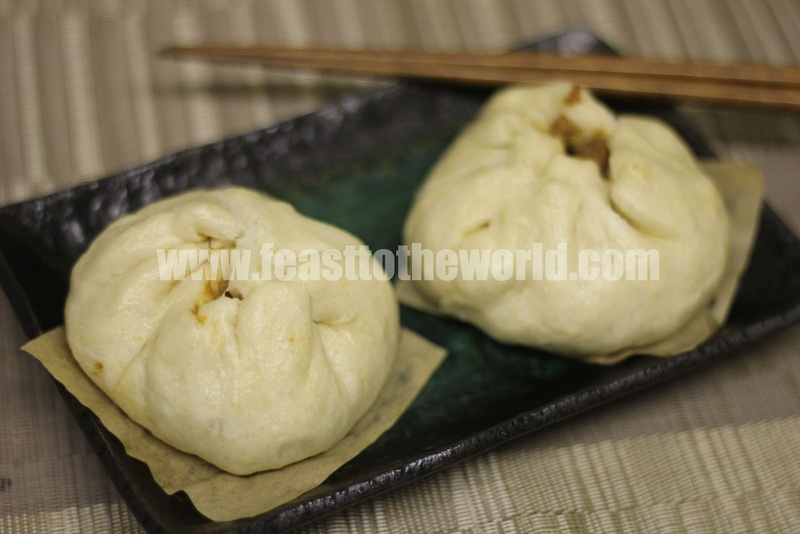 Cover and steam the bun over simmering water for 15 minutes, until the buns are well risen and the fillings are hot. Serves immediately. omg my mum does the same too! she peels off the outer layer of skin because she's paranoid about cleanliness. she also rinses everything in boilign water before use -.- and she soaks all her fruits in fruit 'soap'. she'll have a fit if she sees the way I just pick things off the bushes and eat. I'll be honest, I never really order bao at yum cha. All that bao takes up precious dumpling space!